RJCC Events discos and portable nightclubs are distinctly different. 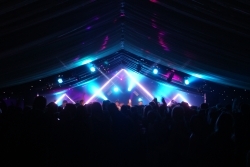 Overview: Our discos and portable night clubs can be individually tailored to transform any marquee, hotel, barn, garden, pool or even sports hall into an intimate venue. We can also theme our discos for Halloween with spooky decroation and props and for Christmas with festive decoration making RJCC Events the idea choice for Halloween Parties and Christmas Office Party Discos. Packages: We have many packages on offer which include our Standard Disco and Wedding Disco for small to medium size events up to 100 guests or so and then our larger packages like the Premier Disco and Portable Nightclub 1,2 & Show Rig packages which cater events for up to 1000 guests. Thereafter please see our Event Production page. 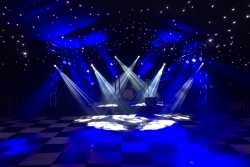 Technical: Programmed lighting by one of our operators provides stunning visual impact, however we can simply provide sound-to-light disco light effects. Mood up-lighting can wash columns and walls with light and can be programmed to almost any colour or to slowly change colour as desired. All of our sound systems are of professional quality and these can also be used for background music during reception drinks, dining and for speeches and awards. Choose from brands such as Cerwin Vega, d&b Audiotechnik, JBL, L-Acoustics, Martin Lighting and Chamsys Lighting Control Systems to name a few. These are no ordinary discotheques... We can bring a complete nightclub production and install it over the dancefloor at your chosen venue to produce a complete 'surround sound' nightclub experience. Ideal for OXFORD UNIVERSITY BALLS - we give unbeatable STUDENT DISCOUNTS for our PORTABLE NIGHTCLUB and SHOW RIG packages and travel all over the UK for University Parties and School Proms. Ludlow Hunt Ball 2015 with Rick Parfitt Jnr and The RPJ Band & DJ Rory C. Another long weekend well spent in a marquee at Downton Hall in Shropshire where we installed litedeck staging, d&b audiotechnik Q Series PA system and Martin Professional lighting and filmed on our new GoPro Hero 4! Our mobile DJ hire and mobile disco prices are very competitive - especially local to us in Oxford. We travel all over the UK and our travels have taken us from Devon and Cornwall to Kent, Norfolk, Wales, Wirral, Edinburgh and even Belfast! We are more than confident that our prices will not be beaten for the quality of goods and service that we provide, but if you have received a more competitive quote, we will try our hardest to beat it upon its presentation to us.